Accepta 2116 is a high performance, environmentally sensitive organic cooling water corrosion inhibitor scientifically formulated for the protection of steel and copper in closed cooling water systems including laser cooling systems. Accepta 2116 is a very effective cooling system corrosion inhibitor chemical that is blended with buffering agents. Accepta 2116 is free from heavy metals or nitrites and chromate. 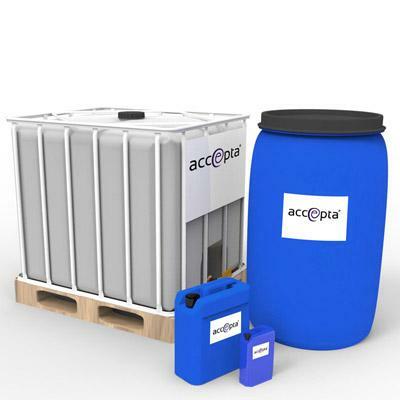 The actives of Accepta 2116 work with a synergic mechanism to control the corrosion rate by forming an auto-limiting film that has no impact on the heat transfer. Accepta 2116 is a high performance corrosion inhibitor that is proven to achieve a protection comparable to that obtained with nitrite-based products, but with the added advantage being much safer and with reduced environmental impact. Acts with a synergic mechanism to control the corrosion rate by forming an auto-limiting film Has no impact on the heat transfer. The normal recommended dosage for Accepta 2116 is in the range of 0.4 – 1.5 kg/m3. It is important to check that the pH is always more than 8.8 as a lower value can be an indication of low dosage or high biological growth. Use normal testing methods to determine the total phosphates and multiply by 18 to get the correct ppm of the product. In high heatflux systems the dosage must be 600-1000ppm. Calcium hardness and chlorides must be 10 ppm maximum. NOTE: Accepta 2116 is not compatible with oxidising biocides.